Get Ready for Your 2019 Goals! Talking about the end of the year is taboo until it’s actually the end of the year. However, it will be the end of December before we know it! With that being said, when January 2019 hits, this will be our fourth installation of the “goals” post here at Humble Beast CrossFit. This year, we want to tackle the goals a little differently. Instead of setting an annual goal (re: 2018 goals post), we would like to focus on more marginal short-term goals. You can think of an annual goal, then figure out how to chop it down into smaller goals. This way, you will have constant progress within almost immediate, short-term reach. Rather than always looking at the annual goal like it’s unattainable. Also, short-term goal getting has been shown to have a higher correlation with adherence. The perceived enjoyment is greater in those who set short-term goals as work to achieve them (Wilson, & Brookfield. 2009). For the month of December, we’re going to formulate a handful of short-term goals. Below is copied from our January 2018 goals blog post, with our suggestions for turning them into short-term goals. The goal here is to attend more often. Set a goal for how many times per week/month you would like to attend. Then reflect on each month and see (i.e. after three months), where you saw the best results holistically. If your goal is to attend the Saturday WOD more, pick Saturday’s to attend yoga, the WOD or both! This is the most overlooked goal and should be paramount to any other. Consistency in attendance will more than likely grant many other goals. The goal here is to get an actual body composition evaluation and set your sights on a realistic body composition change. Stop letting the number on the scale or how your clothes fit be your goal or measurement. Truly learn to understand body composition. Typically, we recommend scans 90-days after starting a major change to your diet or lifestyle. You can make an appointment with our friends down the street at Composition ID, and use the code HUMBLE for a percentage discount on their services (or tell them you’re a Humble Beast CrossFit member). The goal here is to pick one or two areas of your strength that you would like to realistically improve. This is something the coaches can work with you on. One very important thing to mention is that skill and movement comprehension MUST come before thinking/setting a strength (number) goal. Now that MPR (re: MPR post) is a thing, you can at any point test a lower range repetition max with the permission and guidance of a head coach. Test a base line 2,3,4,5RM and retest a few months later. The goal here is to learn that diet means structure, NOT restriction. Understand your nutrition better and set goals to cook for yourself, limit cheat/unhealthy meals. This could work hand-in-hand with body composition, and it should. You should potentially think of these two things as working systematically together, rather than separate. Need help in this area? Our members have access to nutrition consulting from Lindsay. These are just a few suggestions for goals. No matter what goal/s you decide to choose, document your decision and hold yourself and others accountable. Remember not to set your goals or expectations too high, or more importantly, too low! 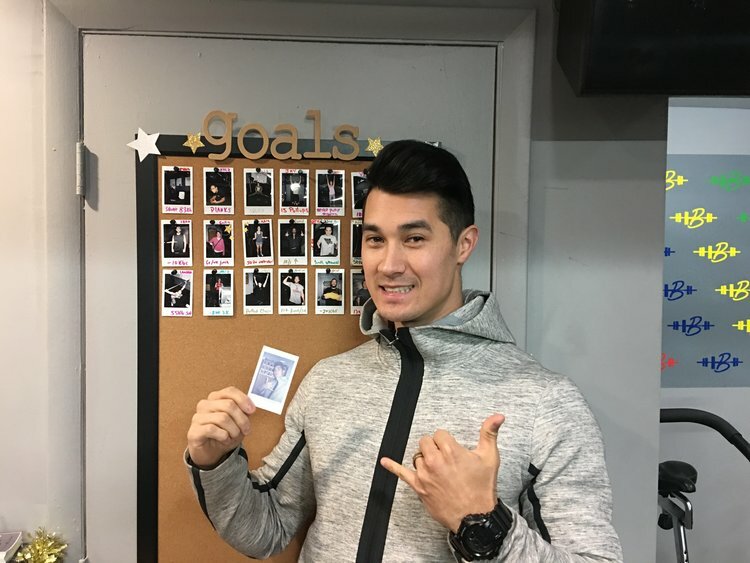 You can take your goal board photo and write a short description before or after class with the coach (pending their availability). You can also ask someone at the front desk (Lindsay, Tiffany or Tamara). Use the goals board for motivation and to help each other with accountability. Be aggressive and active in getting yourself on the goal board! Please note that your goals do not have to be limited to the gym. Anything you want to achieve, we are here as your gym family to help in any way we can! We will revisit this post on January 2019 and actually start to document these formulations. Older PostLet the Coaches Coach!